Sketch map of the Turco-Greek frontier and adjoining districts, 1897. Map published by the Intelligence Department of the War Office. C5 (286). Papua New Guinea 1:250,000 Geological Series, 1972-74. Published by Bureau of Mineral resources, Australia. Bodleian has 2 sheets of a set. D44 (63). Curragh and vicinity, manoeuvre map, 1895. I.D., W.O., No 1109. War Office. C19:22 (9). Magna Britannia complectens Angliae, Scotiae et Hiberniae regna : in suas provincias et comitatus divisa / repraesentante Io. Bapt. Homann (1713). Published by Johann Baptist Homann, Nuremberg, 1713. (E) C15 (952). Another edition of this map published around 1715 was also acquired, shelfmark (E) C15 (953). These are both later states of the map first published in Atlas Novus in 1707. A collection of eighteenth and early nineteenth century maps of administrative divisions in Germany, from the period of the Holy Roman Empire. Published in Nuremberg by Homann Erben and in Weimar by Industrie-Comptoirs between 1702 and 1808. This entry was posted in Uncategorized on 30 January 2015 by stuart. This month marks the 50th anniversary of the death of Sir Winston Churchill. His funeral took place on Saturday the 30th of January, 1965. Churchill’s life was so eventful it would be possible to feature any number of maps of places or events in which he was involved; Gallipoli, Omdurman, Blenheim Park or Chartwell are just a few of many examples. We chose to display here two from the Bodleian collection. 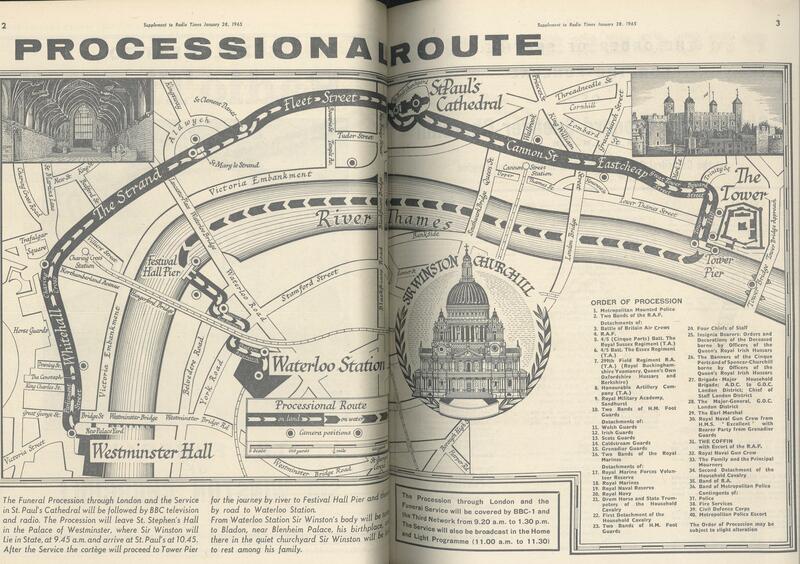 The first is a map from a supplement published in the Radio Times to mark his passing, and shows the processional route his coffin and guard would take through London on the day of his funeral. As well as an historical document of an important event it’s an interesting example of how maps can appear in unlikely places, in this instance a television listings magazine. (The magazine is tightily bound in a volume which includes all the editions for the first half of 1965, hence the distortion in the middle of the image). front line here. 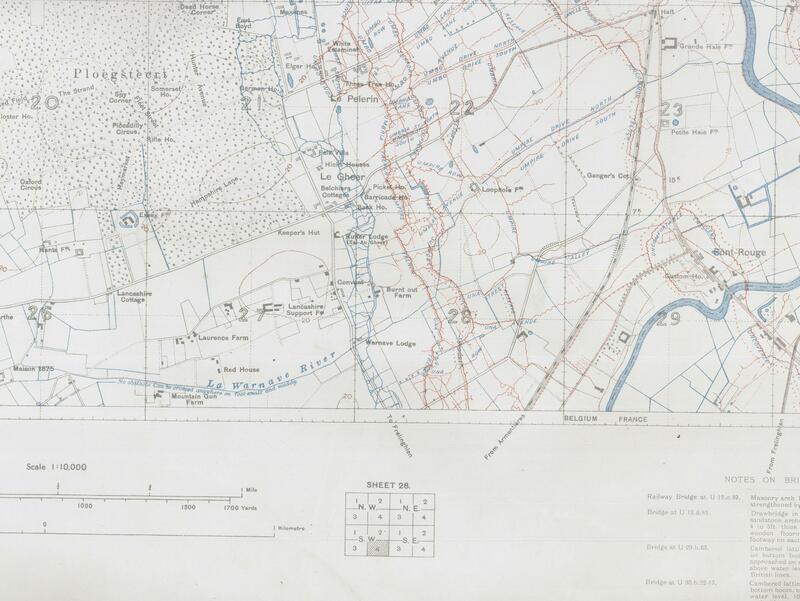 On the map the blue lines represent the British trenches, the red the German. Churchill’s headquarters while at the front was based in Laurence Farm. This entry was posted in Uncategorized on 26 January 2015 by stuart. 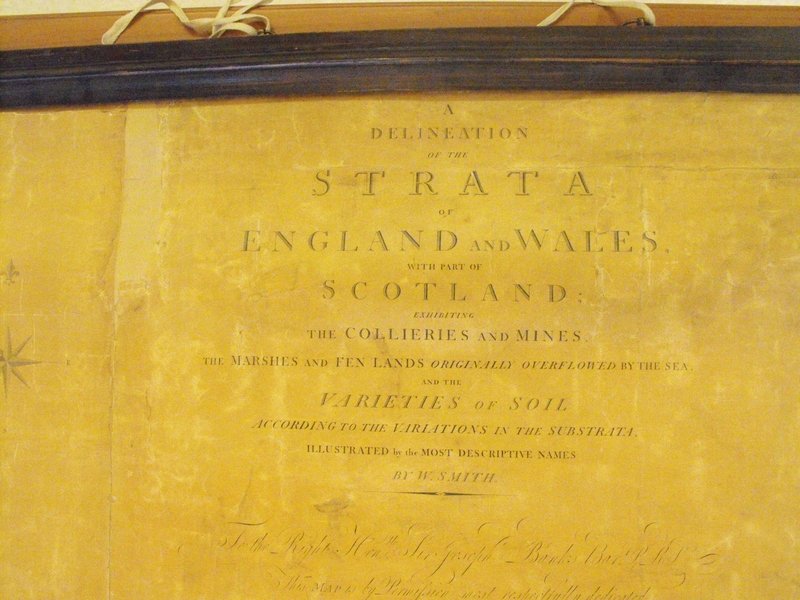 Bodley’s map department have just acquired from the Radcliffe Science Library their copy of William Smith’s celebrated geological map of England and Scotland. 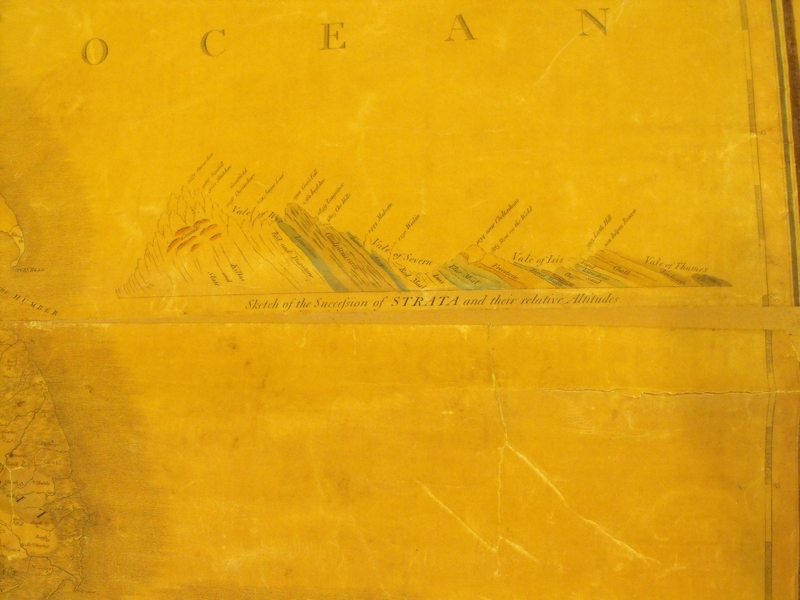 Smith’s map is justifiably famous because it is the first recognized geological map of a country. Smith produced, along with publisher and cartographer John Cary, a number of different editions to his survey, updating the map as more information became available. A large number were personally signed and numbered but the earliest editions, of which this is one, were not. This allows us to date the map to September or October of 1815 and makes this a rare copy, with only a small handful still in existence. 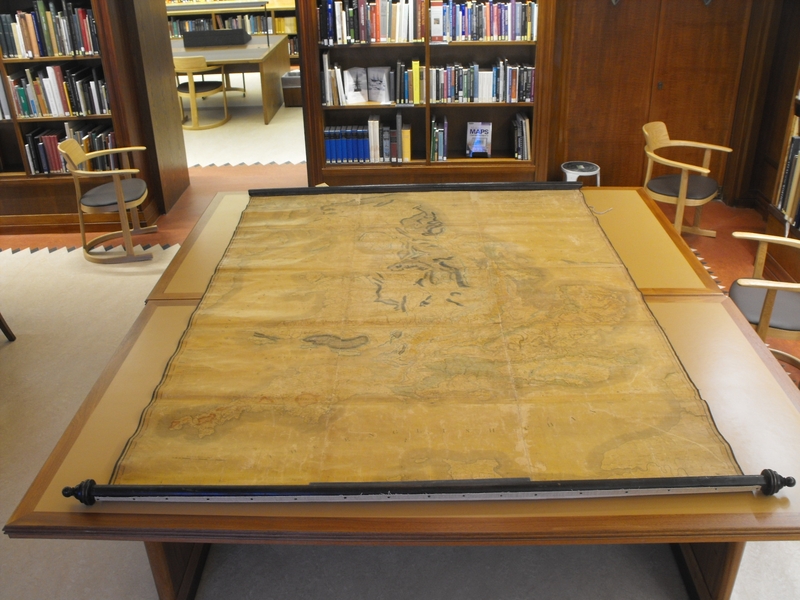 It’s also one of the biggest maps in our collection, measuring 180cm by 255cm and still with its original rollers for wall hangings at top and bottom. Born in the Oxfordshire village of Churchill in 1769 Smith steadily progressed through a series of jobs, starting off as an apprentice to a local surveyor before moving into engineering and the surveying of mines and canals. While moving around the country with his work he began to recognize patterns in rock formations in one area which would be the same as an area many miles away and it was during his work with canal cuttings that he also began to realise how different layers of rocks would hold different fossils, and how these layers with their fossils were also the same throughout the land, thus recognizing the importance of strata in rock. 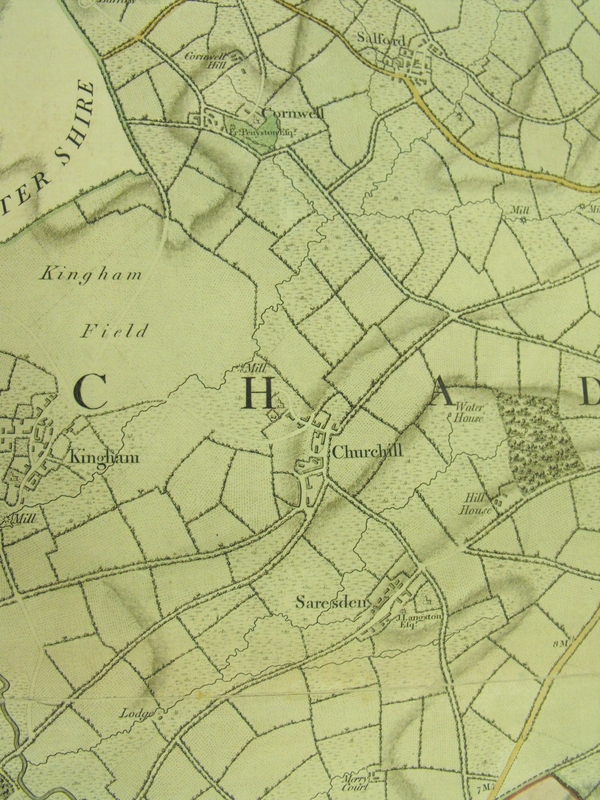 Extract from sheet V of ‘A Map of the County of Oxford, reduced from an actual survey in 16 sheets. Made in the years 1793 and 1794 by Richard Davis of Lewknor, Topographer to his Majesty’. 1797, published by John Cary. (C17:49 a.1). As can be seen when comparing the Bodleian’s copy with those on the William Smith Online website, (www.williamsmithonline.com run by our colleagues in the Natural History Museum in Oxford), ours is not in the best condition. Originally bought varnished to protect the surface and then displayed on a wall has led to the wonderful colours used in the map having faded away, as can be seen from this extract showing a profile of the land between the Bristol Channel and the Thames Valley. In later editions Smith would have signed and numbered each map in the space after the word Altitudes. Smith’s map is dedicated to the Right Honourable Sir Joseph Banks, then President of the Royal Society, but more famous now as the botanist on the voyage of the Endeavour with Capt. James Cook between 1768 and 1771. Banks offered Smith a great deal of support during the production of the map and was one of the projects earliest subscribers. Smith’s flowing dedication to Banks is given under the title of the map, ‘A Delineation of the Strata of England and Wales with part of Scotland; exhibiting the Collieries and Mines; the Marshes and Fen Lands originally Overflowed by the Sea; and the Varieties of Soil according to the Variations in the Sub Strata; illustrated by the most Descriptive Names. By W. Smith, August 1, 1815’. The Natural History Museum of Oxford University will soon, to mark the bicentenary of the map, launch a blog on Smith and will hold over the course of 2015 a number of events and exhibitions featuring articles from their archive; including diaries, letters and the three different editions (including a bound volume in excellent condition) of the celebrated map itself. More information on Smith and his map can be found in The Map that changed the World, by Simon Winchester, 2001, (G24 C17.40), and in the latest edition of the IMCOS Journal (139, Winter 2014, G.Per 17e). This entry was posted in Uncategorized on 9 January 2015 by stuart.